Poppy Developments have a following of happy purchasers, all enjoying their beautiful lifestyle homes. Since moving to Devon 13 years ago, they have been converting fascinating buildings and adding value to redundant agricultural dwellings. These are often buildings with historical provenances situated in areas of outstanding natural beauty. Grade II Listed barn conversions, townhouses, former mills and unique Devon Longhouses are the projects that Simon Stone, founder and hands on Managing Director at Poppy Developments, specialises in. 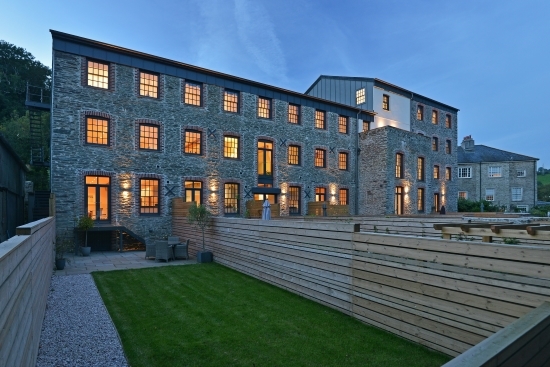 They breathe life back into old properties and at The Mill in Harbertonford, just outside Totnes, purchasers have written glowing testimonials about his skilled team of craftsmen. The Mill was Highly Commended for the ‘Best Change of Use of an Existing Building or Conversion’ by the Local Authority Building Control. If you would like a characterful home with exposed original beams, authentic stonework, cast iron stanchions, vaulted ceilings then The Mill is definitely worth a visit. This end of terrace property consists of a fabulous, bespoke kitchen diner on the ground floor perfect for family living, a convenient utility room and adaptable 4th bedroom, study or playroom. On the entrance level of the property, the spacious living room overlooks the lawned garden. There is also a guest bedroom and family bathroom on this ground floor too. The master bedroom with en-suite has an impressive vaulted ceiling on the first floor, along with the 2nd bedroom which has access to the warm loft space. From the Kitchen there are patio doors leading onto the south facing contemporary style garden with steps leading down to a patio area and the lawn. Underneath the stairs there is a door opening up into the cellar storage space which is a huge space perfect for bikes, paddle boards and kayaks. Ideal for an active family’s lifestyle.